This is the gay neighborhood in Palm Springs. Wasn't always gay, this sign has been there since the 20s. 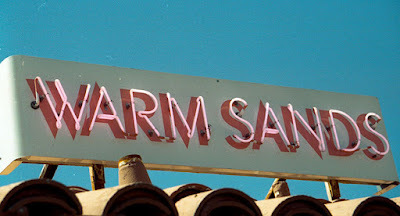 The sign sits a top a resort called Warm Sands Villas. Hoping the owners can comment and tell us a bit of the history about the place. It's fascinating. This statue of JFK is near the airport. 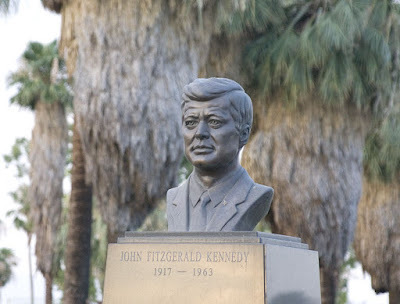 Read about JFK's trip to Palm Springs here. 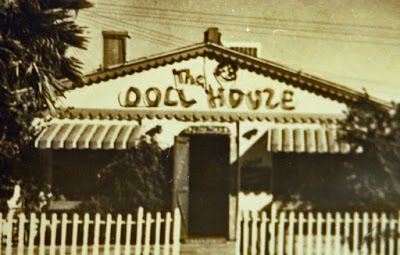 Evidently there used to be a Doll House in Palm Springs. My guess is that it wasn't filled with dolls. 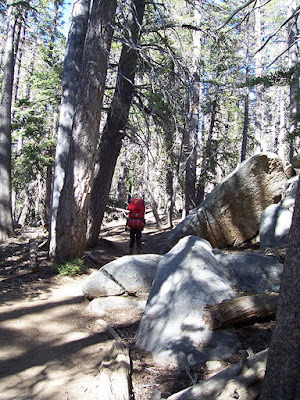 Nice hike up in the mountains above Palm Springs. Way back when. 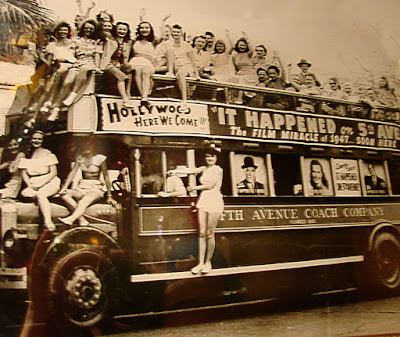 What year do you think this bus ride happened? 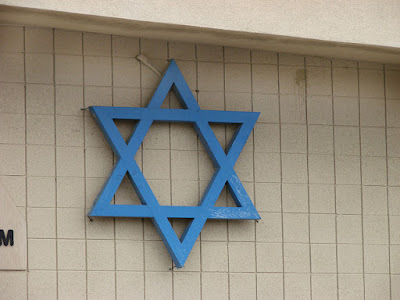 This is a Star of David on building in Desert Hot Springs, the town just north of Palm Springs. The building houses Jewish people who follow Jesus. She has a great name, Palm Springs High School. Notice the the pronoun she in the above sentence. I use it because the school's alma mater does. 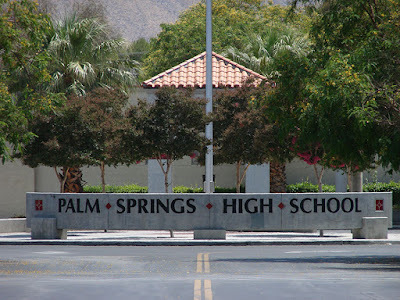 Palm Springs High School is a girl. All this is fine by me, as I'm hoping people would not think I was sexist for bringing it up. Come to think of it, all you fair city bloggers, does your city have any institutions that are referred in the feminine gender? It is a novel idea for equality. After all, America is referred to in the same way. 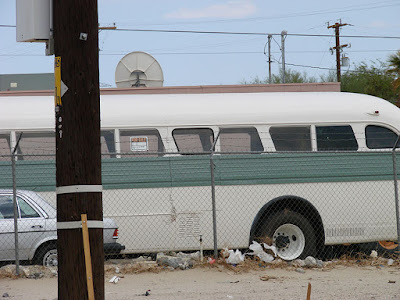 Hop on a bus in Palm Springs and you can go just about anywhere in the Coachella Valley. Here's a just in case you decide to do so. 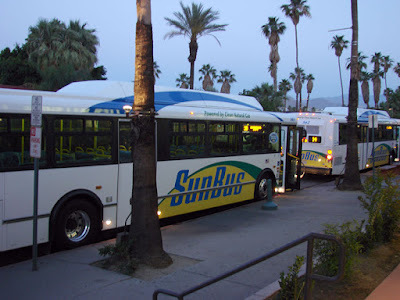 Sun Busses are powered with natural gas, which makes them a whole lot cleaner burning than buses that run on gasoline. Hate to get political here, but if we took all the money that we've spent on the war in Iraq and used it, instead, to buy clean-burning busses for all the third world's cities (the old ones most have now spew all kinds of black soot into the air), maybe just a little less global warming would be happening. Ahhh, to be in Bob Hope paradise. Many now wouldn't even know who he was, answering "Bob who?" Others consider him to be an entertainment legend. He entertained troops, spelled out one liners and acted in movies and on television. He died as a hundred-year-old man. 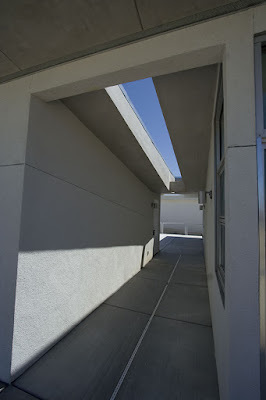 Hope built the home pictured above in 1979, a modernistic, multimillion dollar estate. 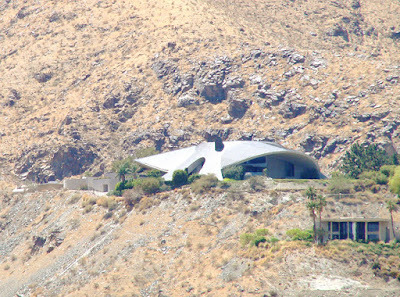 It has a "turtle-shell" roof designed by John Lautner that looks like a flying saucer. And, yes, in Palm Springs, there's a Bob Hope Drive which takes you from Interstate 10 to "The River" shopping complex on Highway 111. ...or seemingly so. 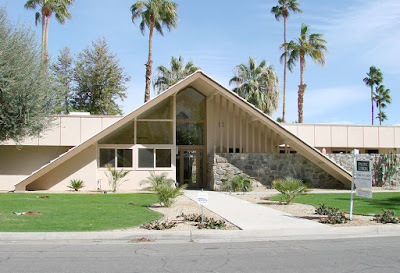 This building has been on Palm Canyon since the 1920s. 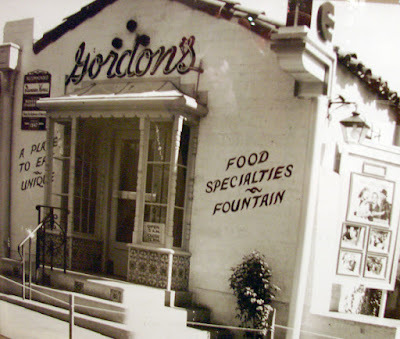 The restaurant Gordon's no longer exists. I can remember when this restaurant was Louise's Pantry. Wish it still was. It's now an upscale Italian eatery. I go there when I have some money in my pocket. 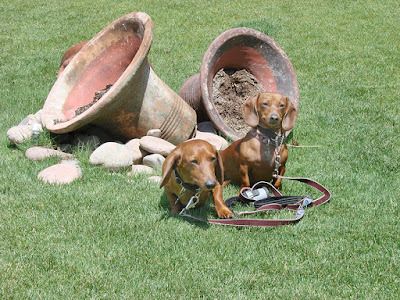 Anything will grow in Palm Springs if you give it enough water. Gee, that title has a certain ring to it. The outskirts of the Palm Springs area can be desolate. With high temperatures and constant wind near and north of the San Gorgonio Pass, the area can look like the set of Road Warrior. Please excuse my vacation--much of this week and much of next, I'll be touring Ecuador. My posts will not be daily as access to the Internet is limited in the Amazon and in the Galapagos. Thanks for your understanding. I'll be back dailyphotoing next week. 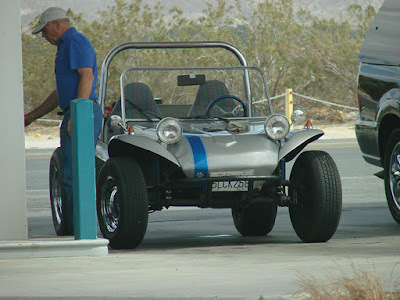 We've got all types of vehicles here in the desert! Okay, so Palm Springs is known for golf, but it also has beenn known to be a tennis-lover's paradise. The saddest part of the demise of tennis with respect to the area's resorts was the closing of the Racquet Club Hotel and Tennis Club. Back in Palm Springs' heyday all the movie stars used to play there (that would be in the 1950s). Come on now, can you name some movie stars that came to Palm Springs back then? 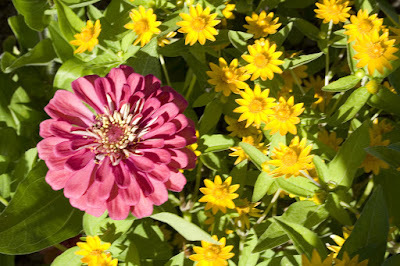 Tell us Daily Photo Bloggers, who were the stars that loved Palm Springs? 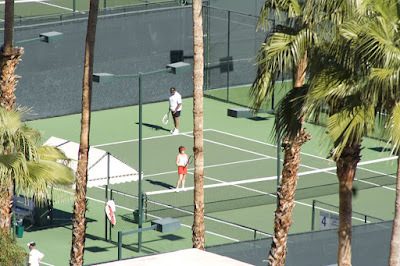 BTW--the tennis court pic above is taken from above the mountain just to the east of downtown Palm Springs. 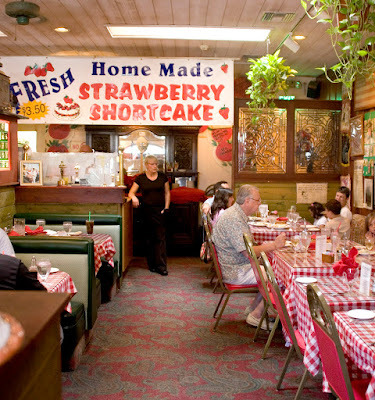 The strawberry shortcake at the Red Tomato in Cathedral City (town next to Palm Springs) is to die for. BTW: This is a pic of the inside of the restaurant.